It is very important to keep your kitty hydrated and the cat water dish that you choose plays a big part in this. Cats are not naturally big drinkers and many have to be coaxed into taking on enough fluid to keep them healthy. Cats that do not drink enough can soon become dehydrated and that can cause chronic health concerns including kidney problems. By choosing the correct cat water bowl and filling it with fresh water, you can encourage your kitty to drink. The shape, size and material are all important. The height is another factor that you may not have thought of. Many cats prefer raised water bowls in a stand. Others prefer to have a reservoir that continually tops up the bowl with fresh water. To help you and your kitty decide on the best water bowl for cats in your house, here is our useful guide. This one gallon capacity, gravity-fed water bowl is exactly what busy cat parents need for their kitty when they are out all day at work or on a short trip away. Your cat will get a constant supply of pure and delicious water that will encourage them to stay hydrated. As your pet drinks, the water is refreshed from the reservoir after passing through a charcoal filter. The bowl is made from a Microban antimicrobial material which inhibits the growth of bacteria that can cause odors and staining. The whole thing is very easy to clean and the filter is very easy to change. The reservoir is available in sizes ranging from half a gallon to four gallons and the bowl is available in several colors. This kitten bowl is available in three sizes and has an attractive paw print and princess crown design in classic black on white. It has been designed to make your kitty as relaxed as possible when they are drinking. Cats prefer to eat and drink with their heads at a higher level than their stomach to prevent backflow and regurgitation. This bowl is elevated on its own built-in stand to achieve just that. The kitten bowl is made from porcelain which is both dishwasher and microwave safe. It meets all the relevant FDA standards and is both lead and cadmium free. You can also use the bowl for food, which will stay in the center thanks to the unique curved shape. There is also a discrete inner lip which prevents spillage. 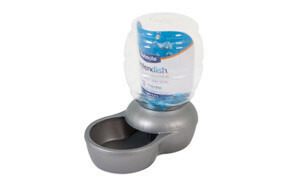 A gravity-fed water station that is available in three sizes and delivers constant clean, fresh water for your cat. It comprises a water reservoir made from BPA-free plastic and a stainless steel water bowl which is removable and can be thoroughly cleaned in your dishwasher to get rid of any harmful pathogens. It works through a flow-control valve which only allows fresh water to flow into the bowl when your pet drinks. If you want to make the water even more pure for your cat, there is an optional filter which can remove sediments and odor. The reservoir locks securely onto the bowl stand so that it does not get knocked over and cause a spillage. The entrance to the water reservoir is wide so that you can clean it with a cleaning tool. It has a handy flow-control valve which prevents water spilling when you are carrying it and which then releases water when it is attached to the bowl housing. Perfect for when you are traveling with your cat, this is a set of two collapsible bowls that are 5.1 inches in diameter. The bowls come in a choice of colors and they both fold down to just half an inch thick. When fully expanded, they are 2.1 inches in height and will hold 12 fluid ounces of water. 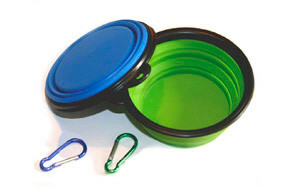 These collapsible bowls are made from high-quality silicone which is completely safe and free from toxins. The silicone is very durable and can be repeatedly rinsed and wiped clean. They are non-slip and will not scoot across the floor when your cat is drinking. They come with matching carabiners so you can clip them to a backpack or travel crate and they will never get left behind. Alternatively, they are compact enough to fit in a glovebox. 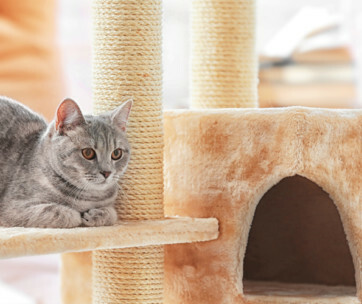 Thanks to the elevated and sturdy design, even the clumsiest kitty is unlikely to knock this feeder over. It comprises two stainless steel bowls in a wooden stand but comes with an extra two bowls so two can be in use whilst the other two are in the wash. Two bowls will hold one and a half cups of water and the other two will hold two and a half cups of water. Because the bowls are raised, this feeder is perfect for cats with arthritis or who have neck or back conditions or injuries. It is also great for cats with digestive issues as the water flows to the stomach aided by gravity. The bowls are kept in place by silicone rings and the feeder has an attractive appearance that would suit any home. A double bowl set in a clean, crisp modern design and available in several colors. 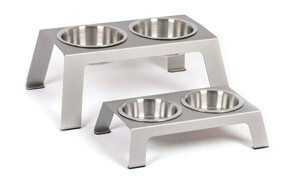 It comprises two bowls made from stainless steel and is perfect for cats or small dogs. The cat bowls are placed in a PP resin base to help prevent spillages. The bowls are dishwasher-safe and durable. The feeding station lifts the bowls to 0.8 inches above the ground which is a comfortable height for most cats. It helps the flow of the food to the stomach and makes swallowing a lot easier. Because both cat bowls are removable, you can easily fill them and keep them clean. Some cats do manage to spill them! A heavyweight water bowl for cats that is made out of stainless steel. It is very easy to keep clean and does not absorb odors. You can even pop it in the dishwasher. One of the problems with regular stainless steel bowls is that they can slide around the floor but this one has a patented rubber bonded coating underneath it so it stays still. It also has lower sides than most bowls so it allows easy access for your cat and encourages them to drink. They are less likely to push on the bowl and there will be no sliding noise to put them off so your kitty can stay hydrated. This complete dining set consists of two stainless steel bowls of differing sizes set in a plastic stand. This keeps them still when your cat is eating and drinking so the noise of a bowl sliding across the floor will not put them off. You can use the bowls for food and water and they are very easy to clean – you can even put them in the dishwasher. The exterior is made of white plastic but is also available in pink. This attractive dining set will look great in any home. Some cats are able to pull out the bowls! This product is a bamboo stand into which two stainless steel bowls fit neatly. The bamboo is water resistant and because it is elevated, it is very comfortable for your cat to have a drink. The four inch high model will suit most cats and will make swallowing easier. It has feet that are anti-slip so it will not slide around the floor when your cat is drinking. This stops them being frightened by movement and noise and so they will drink more and stay hydrated. The bowls themselves are durable and easy to clean – they are dishwasher safe. It would make a perfect gift for a cat lover and comes with assembly instructions. This is an extremely durable set of cat bowls made from anodized aluminum which is very resistant to corrosion. It will not chip and is very long-lasting as well as lightweight. It comprises two bowls in a stand to elevate the eating and drinking levels. The height of the cat bowls will make your cat more comfortable as they drink and will encourage them to stay hydrated. It also prevents whisker fatigue thanks to the size and shape of the bowls. Buying the right cat water bowl will encourage your kitty to drink plenty and stay healthy. There is plenty of choice out there so here are the things that you should consider. The size of the cat water dish is important. It must be able to hold enough water to keep your kitty hydrated if you are out for the day. Water bowls that top themselves up from a reservoir will last a lot longer than a simple water bowl and will keep the water fresh. Some cats are very fussy about what material their bowl is made out of. It is best to choose a material that will not absorb tastes and odors and which is durable. Wide bowls that will not touch the edges of your cat’s whiskers will make them feel more relaxed when they are drinking and will prevent whisker fatigue. Many cats would prefer to not have to bend down when they are drinking. They have to swallow uphill and it can aggravate neck and back conditions. Senior cats, in particular, often prefer to have raised bowls. Cats cannot stand dirty water bowls so you must be able to keep them very clean. They need to be made of a nonporous material and preferably they should be dishwasher-safe. Cats will be put off drinking if the cat water dish skids along the floor and makes a horrible noise. Some bowls prevent this by having rubber coatings on the underside edge. No one likes clearing up spillages. Bowls with a solid, wide base are less likely to tip over. There are several different types of cat water bowls to choose from depending on your preferences and your budget. Having said that, the person that will have the final say here is your cat! As a cat owner, you will already be aware that cats have very particular likes and dislikes of their own. What suits one cat, will not suit another and it may take some trial and error. 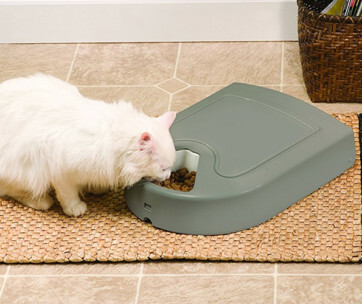 Your first choice is a very basic, stand-alone cat water dish that you can place directly on the floor or on a mat. They are the cheapest option but have some drawbacks. They can slide around and that makes a noise which will put some cats off. Also, they can get tipped over. There are heavy-duty versions that are more stable and some have rubber undersides to keep them quiet and still. Your second choice is a set of bowls that are set into some kind of stand. The stand could be made out of wood or plastic. Because the raised water bowls for cats are in a stand, they will not tip over (in theory) and are at an elevated height. Many cats find it more comfortable to drink from an elevated watering bowl because they are not trying to swallow uphill. Senior animals with joint issues may find raised water bowls for cats particularly useful. There can be a problem with washing the bowls but this is overcome if they are removable. Sometimes the stands come in different heights for different pet sizes. Finally, you could choose a watering bowl that has a built-in reservoir. This will top up the bowl with fresh water as your cat drinks. Because cats love a constant supply of fresh water, this is ideal for them. Don’t forget collapsible silicone water bowls for when you are traveling. Several different types of material can be used in water bowls for cats and there are advantages and disadvantages for all of them. Here are the most popular options. Glass is a good material for a watering bowl because it is non-toxic yet nonporous. It won’t react with the water and will not have an odor that could put your cat off drinking. Glass will retain the fresh taste of water that your cat loves and most glass is very easy to clean and can be put in the dishwasher. However, there is lead in some types of glass and it can break if it is knocked over. Broken glass is dangerous for cat’s paws and human feet! Stainless steel is a very durable and does not absorb tastes or odors. For this reason, it is a great material for a cat water bowl. The bowls will not break if you drop them and are resistant to corrosion and staining. They are very strong and can be put in the dishwasher but even stainless steel can sometimes corrode. Ceramic is also nonporous and should not have a taste or a smell. Most ceramic bowls, but not all, can go in the dishwasher. However, some ceramics do contain heavy metals and are not safe for use with food or water so exercise some caution. Ceramic will break if you drop it. Plastic bowls are usually the cheapest option but you need to be careful to select a high quality product. Do not choose a product that contains BPA because these can cause health problems. Some plastics can cause allergies. Q: How long can a cat go without drinking water? A: A healthy cat will get all the water they need from their food and from a source of water. The problem is that cats can be very fussy about what they drink from. 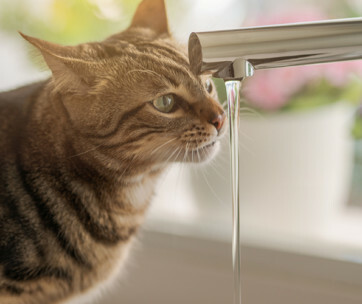 In nature, they would drink from a stream or river and that is why many owners find that the best cat water fountains are a sensible investment for them. If you do not want to use a water fountain, it is a case of finding a bowl that your cat likes. Cats can survive for some time without eating and this can be up to a month. However, when it comes to hydration, the situation is more serious. A cat cannot go longer than a few days without water. Dehydration in cats is a serious issue that can cause irreversible kidney damage. Q: What is whisker fatigue? A: Your cat is highly dependent on their whiskers to inform them about the world around them. At the base of every whisker, there is a sensory organ called a proprioceptor. This sends information about the area around your cat’s body and helps them move around in the dark, hunt prey and determine whether they can fit through spaces. Most of the time, your cat will not be able to control all of the signals that their whiskers are sending. Therefore, there comes a point where they can get overloaded with information because their whiskers are so sensitive. 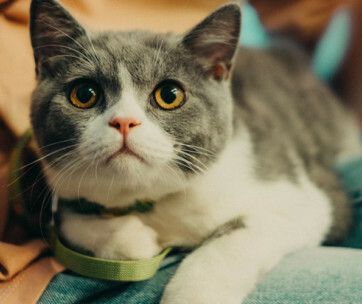 Even a tiny change in air current can set them off and eventually too many messages can cause your cat to feel stressed – this is termed whisker fatigue or whisker stress. Some experts do not agree that whisker fatigue actually exists but everyone agrees that cats can suffer from stress! Food and water bowls can play a role if your cat’s whiskers touch the sides every time they dip their head in. You can watch out for signs of whisker fatigue in your own cat. They will often pace around in front of the bowl and may paw at it but refuse to dip their head in. They may even knock it around and act aggressively. However, this can also be a sign of some medical conditions so you should discuss this with your vet. A shallow and wide water bowl may suit your cat better as their whiskers will not touch the sides. Never be tempted to trim your cat’s whiskers though because this will not work. 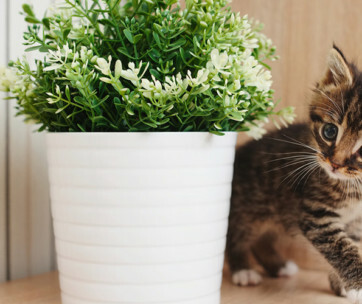 Q: Where should I place my cat's water bowl? A: Cats can be quite fussy about the location of their water bowl. It has to be in a location that they like or they will not drink and could become dehydrated. In general, they do not like high-traffic areas or areas where there can be sudden and startling noises. Therefore, place the water bowl in a quiet area of the house away from where there is a lot of movement and from where children are playing. Many cats also do not like their water bowl to be near their food bowl, especially if food can get into the water bowl and make it dirty. Cats only like clean and fresh water! Cats may also prefer not to have their bowl by their litter tray and if you have more than one cat, you will definitely need more than one water bowl. The bowl will need to be placed on a mat to stop it sliding if it does not have its own non-slip base. A bowl that skids around a hard floor will certainly put your cat off drinking with the noise and the movement. Q: How often should I change my cat’s water bowl? A: The simple answer is – very frequently! Cats love fresh and cool water and ideally would prefer to have a source of running water. Cat water bowls need to be thoroughly cleaned every 24 hours but will need to be topped up several times a day. As soon as the water bowl gets contaminated with dust, dirt or food, you will need to clean it and fill it back up with fresh water. 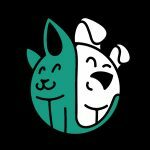 Some reservoir cats bowls automatically refill as your cat drinks. Q: What size water bowl should I buy? A: This depends on your cat. A large, shallow bowl is best to avoid whisker fatigue. Also, it needs to hold enough water to keep your cat hydrated if you are out for the day. There is no point in buying a huge bowl and thinking that you won’t have to top it up very often because this will not work. Your cat will not touch the water if it has been in the bowl for too long and you will end up having to change it anyway. Also, cats are very good at tipping their water bowl over and you don’t want too much water all over the floor! This is one of the main advantages of raised water bowls. 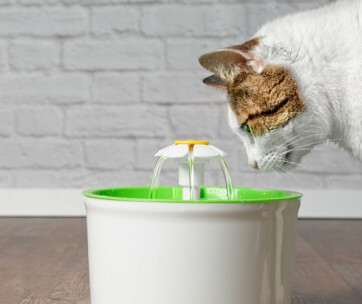 Our top pick of the best water bowl for cats has a built-in reservoir with a capacity of one gallon. It feeds by gravity into the bowl giving a constant supply of pure and delicious water that will encourage your cat to stay hydrated. How Much Water Should Your Cat Be Drinking Every Day?